Basketball season is already underway, and catching a home game is just one of the many fun things to do on this month's calendar, which also includes a variety of exhibits and holiday events. There are still plenty of activities at Emory as the semester winds down, including a variety of holiday events as well as opportunities to unwind amidst seasonal stress. From movies to meditation, here are 10 things to do this month for $10 or less. 1. Shop for yummy gifts at the Emory Farmers Market. The Emory Farmers Market is a great place to shop for delicious treats, whether you want a fresh, responsibly grown ingredient for a seasonal recipe, a small gift to bring to a holiday party, or a present for the foodie – or just hungry — friends on your list. Many options cost less than $10. The farmers market is held Tuesdays from 11 a.m. to 3 p.m. on the Cox Hall Bridge; this month's events are Dec. 1, Dec. 8 and Dec. 15, then the market goes on hiatus until the new semester begins in January. 2. Sit back for an evening of anime. Emory Cinematheque's semester-long Japanese anime film series concludes Wednesday, Dec. 2, with "Summer Wars / Sama Wozu" (2009), in which a social media network becomes the target of a terrorist attack, transforming a family reunion into a struggle (by means of social media avatars) to avert global disaster. The free screening takes place at 7:30 p.m. in White Hall Room 208. 3. Celebrate with the Holiday Family Jubilee at Emory Point. Emory Point, the popular mixed-use development on Clifton Road, hosts a Holiday Family Jubilee on Saturdays from Dec. 5 through Dec. 19. From noon to 4 p.m., enjoy holiday activities, strolling carolers, kid-friendly crafts, character meet-and-greets, and more. These activities are complimentary; of course, your budget for shopping and dining at Emory Point's many retailers is up to you! 4. Enjoy a dance performance — or three. As the semester winds down, take a break for a dance performance on either the Emory or Oxford College campus. On Sunday, Dec. 6, at 5 p.m., Emory Dance partners with CORE Performance Company and The Field in New York for a Fieldwork Showcase highlighting work created by Atlanta artists, the culmination of a 10-week workshop. Tickets are $7 in advance at coredance.org or at the door for the show in the Dance Studio of Schwartz Center for Performing Arts. Also on Sunday, Dec. 6, head to the Performing Arts Studio at 1804 North Decatur Road for an Argentine Tango Music and Dance Performance. Admission is free for this 7 p.m. show with Music/Dance 211 students in their final performance. The Oxford Dance Performance on Monday, Dec. 7, at 7:30 p.m. features Oxford dance students directed by Kathleen Wessel. The free performance takes place at Williams Hall on the Oxford College campus. 5. Get in the holiday spirit with festive concerts. The Oxford Chorale Holiday Concert is Thursday, Dec. 3, and Friday, Dec. 4, at 8 p.m. in the chapel on Emory's Oxford College campus. Admission is $5 for adults, with free admission for children; tickets are available at the Oxford student center and dining hall, or they can be reserved by an email to marchet@emory.edu. Tickets will also be available at the door 30 minutes prior to the concert. The free, family-friendly Christmas event "Santa’s Favorite Chamber Music" caps off the holiday performances at Emory on Sunday, Dec. 13, at 4 p.m. in the Michael C. Carlos Museum. Mr. Claus himself appears to introduce some of his favorite classical works. 6. Relieve stress with mindfulness meditation. Learn about techniques including meditation, breathing and movement exercises to help you slow down in the midst of this busy season at "Mindfulness Meditation 101." Offered by the Faculty Staff Assistance Program, this free, hour-long workshop begins at 1 p.m. on Thursday, Dec. 10, in the Rita Anne Rollins Room on the eighth floor of the Grace Crum Rollins Building in the School of Public Health. 7. Check out "Ransom Notes" on your lunch break. This month's performance in the John and Linda Cooke Noontime Concert Series is titled "Ransom Notes," but you don't have to pay. The free concert on Friday, Dec. 11, in the Reception Hall of the Michael C. Carlos Museum includes William Ransom on piano and Kate Ransom on violin, performing César Franck’s beautiful Sonata in A Major. 8. Cheer the Emory Eagles on the basketball court. Basketball season is already underway, so bring your friends and family out to cheer on the Emory Eagles for home games. 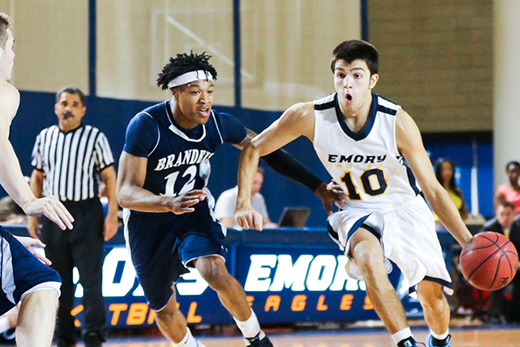 The Emory men's basketball team takes on Covenant College at 7 p.m. on Wednesday, Dec. 30, at home, after several away games earlier in the month. The women's basketball team plays all of its December games on the road, but you can catch them here on Jan. 2 at 4 p.m. versus Maryville College. Both games take place at the Woodruff PE Center; admission is free. 9. Experience "Indigenous Beauty" and more at the Carlos. "Indigenous Beauty: Masterworks of American Indian Art," the current exhibit of Native American art at the Michael C. Carlos Museum, runs through Jan. 3. The museum also hosts a diverse slate of public events related to the exhibit; this month's options include a lecture on American Indian baskets, an "AntiquiTEA" focused on the legacy of the Indian Wars and George Custer, storytelling and a gardening workshop. School holidays also make December a wonderful time to bring kids to view the permanent Carlos collections, including the oldest Egyptian mummy in the Americas. Museum admission is free for Emory faculty, staff and students. Otherwise, regular admission is $8 for adults and $6 for other students, seniors and children ages 6-17. Children 5 and under are free. 10. Catch campus exhibits before they close. "Indigenous Beauty" isn't the only exhibit nearing its close at Emory. December is also your last chance to see two other popular exhibits. "It's in the Cards: An Interactive Art Exhibit," based on creative modifications of old library catalog cards, closes Dec. 31 on level 2 of Woodruff Library. "'The Waters and the Wild': Alen MacWeeney and Photographs of Ireland" closes Jan. 3 at the Carlos Museum.